In a small bowl, stir together the tomatoes, salt, Italian Seasoning, and brown sugar. In another small bowl, toss the spinach and pesto together, just enough to coat the spinach leaves. In a small, nonstick skillet heated to medium-high heat, cook the onions for about a minute, then add the turkey. Cook until fully browned. Unroll both cans of dough into 4 long rectangles. Place dough rectangles side by side, on an ungreased cookie sheet; firmly press edges and perforations to seal. Press to form 15x13-inch rectangle. Spoon half of the tomato mixture in a 6-inch wide strip lengthwise down center of dough to within 1 inch of short sides. Sprinkle half the spinach and meat mixtures on top. Sprinkle half the cheese on top, then add a second layer of each filling on top. Finish with mozzarella. Fold short sides of dough 1 inch over filling. Fold long sides of dough tightly over filling, overlapping edges in center 1/4 inch; firmly pinch center seam and ends to seal. Brush with milk; sprinkle with poppy seed. Bake at 375°F. for 23 to 27 minutes or until deep golden brown. Saute 2 cups of diced veggies (bell peppers, mushrooms, etc.) and substitute for the browned ground turkey if desired. The Pillsbury Bake Off is coming up -- get psyched with this twist on a crescent lasagna recipe from a past Bake Off Contest! 'Tis the season for baking. Pillsbury baking, that is! To celebrate this year's Pillsbury Bake-Off, we're bringing back a few of the classics. And this recipe is an old-time classic with a newfangled twist on flavor. Pillsbury Crescents wrap themselves around traditional lasagna fillings in this Crafty Crescent Lasagna Bake Off recipe of the past. But, rather than using heavy sausages and red meat, we've swapped this recipe out with ground turkey and bright green spinach in our Veggie Crescent Lasagna version! This recipe is so simple, and so delicious, it might just become a fave in your own kitch! For starters, nab yourself two cans of these little babies. Roll them out, press them into a large rectangle, then fill 'er up with pesto-tossed spinach, a homemade fireroasted tomato sauce, and browned ground turkey. Don't forget the mozzarella! Wrap up your little bundle. 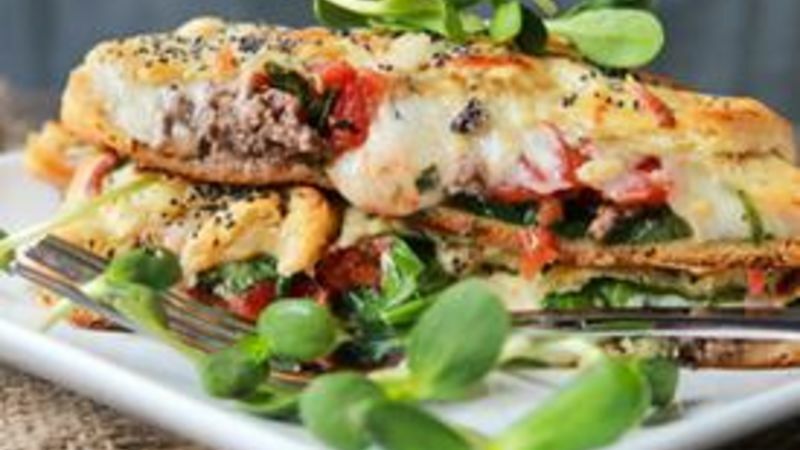 Bake and prepare yourself for some seriously fabs dinner tonight! All you gotta do is slice it up and enjoy it! See what I mean? This is the very best of the Bake Off. And now it's in your belly. Grrr. Saute 2 cups of diced veggies (bell peppers, mushrooms, etc.) and substitute for the browned turkey if you'd like! Want to know more? Click here to check out everything about the Bake Off, from this year's entries to when the winner will be announced!